Unemployed once again, Jimmy Logan (Channing Tatum) and his brother Clyde (Adam Driver) plan an elaborate robbery at North Carolina’s Charlotte Motor Speedway during the legendary Coca-Cola 600 race . A key part of this plan will require the assistance of an explosives expert. Enter Joe Bang (Daniel Craig), a man willing to help - for a price. All the Logan brothers need to do is break him out of jail. What could possibly go wrong? While more 7-Eleven than Ocean's 11 (as the film itself concedes), Logan Lucky is an entertaining ride that explores themes (such as healthcare liability and unemployment) keenly relevant to much of American society today. Legendary hitman, John Wick (Keanu Reeves), is forced back out of retirement by a former associate plotting to seize control of a shadowy international assassins’ guild. Bound by a blood oath to help him, John travels to Rome where he squares off against some of the world’s deadliest killers. John Wick: Chapter 2 is a thrilling and consistently entertaining film full of exciting and beautifully shot (very shiny) action sequences. It is awesome to see Keanu Reeves back in this impressive and physically demanding role. He is a mesmerising mixture of James Bond (all sharp suits, gadgets and guns) and a Bond villain - everyone’s favourite boogeyman. Baby (Ansel Elgort) is a talented, young getaway driver who relies on the beat of his personal soundtrack to be the best in the game and to cope with his debilitating tinnitus. When he meets Debora (Lily James), the girl of his dreams, he sees a chance to leave a life of crime and make a fresh start. However, getting away from crime boss, Doc (Kevin Spacey), will not be easy. Baby Driver is not a crime drama set to music, it is a film with music at its heart and a beat pulsing through its veins. Wright’s direction and his film's editing (by Paul Machliss and Jonathan Amos) are phenomenal. Every key move is accompanied by the diegetic sound of 2017's most exciting and impressive soundtrack. In this the third chapter of his story, Caesar (Andy Serkis) and his apes are forced into a deadly conflict with an army of humans led by a ruthless Colonel (Woody Harrelson). After suffering horrific losses, Caesar is filled with a dark desire for vengeance and sets off on a quest to avenge his kind. A journey that will determine the fate of both apes, humans and the future of the planet. War For The Planet Of The Apes could so easily have been an all out simian versus human battle-fest. That Reeves has chosen to retain his intimate focus on Caesar’s journey makes this film feel all the more powerful. As a result, War For The Planet Of The Apes is a surprisingly emotional experience - a deeply satisfying conclusion to a truly superb trilogy. After discovering the world of the Jedi and realising her potential place within it, Rey (Daisy Ridley) joins Luke Skywalker (Mark Hamill) as the Rebels - lead by General Leia Organa (Carrie Fisher) - seek to stop the evil agenda of Supreme Leader Snoke (Any Serkis)'s First Order. From the stunning, action packed opening of Star Wars: The Last Jedi, I knew we were all in safe hands. Director, Rian Johnson, has created an exciting and gripping film that is both a natural progression in the Star Wars story and also takes that story in new and unexpected directions. 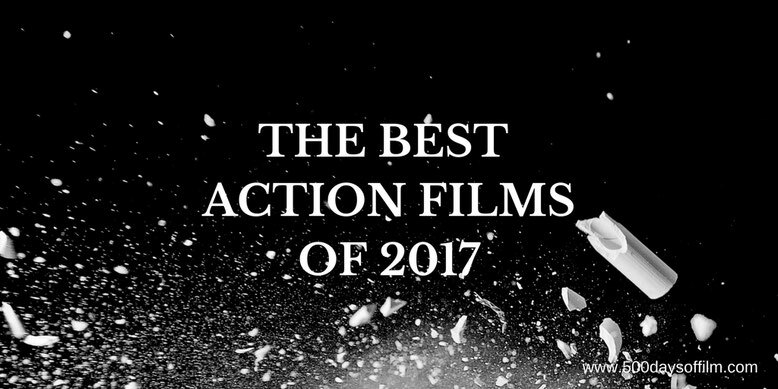 What Is Your Favourite Action Film Of 2017? Phew... it has been a really action-packed year hasn't it! What were your favourite action films of 2017? Let me know in the comments section below or via Facebook or Twitter (@500DaysOfFilm).